^ Quickfacts.census.gov - Allegan County - accessed 2011-12-06. ^ American FactFinder - Allegan, Michigan - accessed 2011-12-06. ^ Quickfacts.census.gov - Holland, Michigan - accessed 2011-12-06. ^ Thomas, Henry F. (Ed.) (1907). 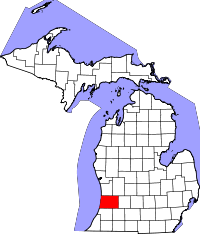 A Twentieth Century History of Allegan County, Michigan, pp. 4-6. The Lewis Publishing Company.